Most people living in America are seeking their dreams. Even people involved in crime dream of becoming rich. Millions immigrate to this country seeking the “American Dream”. With all the wealth (even the American poor are wealthy in comparison to most of the world), people in America are still discontented and unhappy. Many are living a nightmare created by their own godless choices. Thousands upon thousands of people are ruining their lives and the lives of their family as they covet more things, a fancier lifestyle, a more expensive automobile, a bigger house, and even a different spouse. Furthermore, they think they are doing the right thing. Most people think if they had more money, all their problems would be solved and their dreams would be fulfilled, but that is not true. Ecclesiastes 5:10-12 He who loves money will not be satisfied with money, nor he who loves wealth with his income; this also is vanity. When goods increase, they increase who eat them, and what advantage has their owner but to see them with his eyes? Sweet is the sleep of a laborer, whether he eats little or much, but the full stomach of the rich will not let him sleep. The wealthy have a lot of worries—how to keep their wealth, how to keep others from taking it from them, how to keep from losing their investments. The reason Jesus speaks out against anxiety is because worry is filled with fear and doubt about God. Worry is like a nightmare you can’t wake up from. Worry divides the mind! It leads a person to become distracted with little things and miss what’s important. When we worry, we can’t put our whole heart into serving God, because we are troubled about how we’ll take care of ourselves. We live in a morally and religiously corrupt world that has forgotten and forsaken the will of God found in Scripture. Most have forsaken Christ for worldly ways, money, power, popularity, and possessions. This moral corruption leads to nothing but a nightmare of misery and brokenness. It’s promotes selfishness, and leads people to hate one another. As followers of Christ, we should show the world another way, the Way of Jesus Christ. Unfortunately, with all the uncertainties, lawlessness, and trouble in the world, we sometimes forget the Way of Jesus Christ. With all the dishonesty in politics and the lack of any moral, honest, candidates running for president, we can be tempted to despair. We forget this is not our home. We don’t have to worry about the things of this world. We can vote, but regardless who controls the Whitehouse, we belong to a Kingdom not of this earth. And we serve a living King, who is in control and will take care of us. We don’t have to look to the government for our contentment. Nevertheless, we can get so caught up in everyday life that we forget how much we need to draw near to King Jesus every day. Worry can cause us to take our focus off of Jesus and what He will do in our lives. We can easily forget that God is the source of every blessing and good thing in life. So, when we worry, we lose the peace of God, we become like the rest of the world, and we lose our testimony. Peace is a fruit of the Holy Spirit. We need to seek the Holy Spirit every day. If we are filled with the Holy Spirit, He will take away our fear and doubt, and replace it with a peace that surpasses understanding. He’ll set a guard around our heart and our mind, so that fear and doubt won’t overwhelm us. Do you have a need? Let your requests be made known to God with thanksgiving, and He will give you peace. God will take care of you. Jesus told us to consider the evidence of what God is doing all around us. Jesus wants us to look at His creation closely and to consider it! Look what God is doing for the birds and the flowers. If God takes care of them, He’ll take care of His children. Quit worrying is what Jesus is telling us! Now to seek means setting aside everything else until you find and possess what you seek! We will find the Kingdom of Jesus Christ if we seek Him with all our heart. For example, Jesus said in Matthew 13:45-46, Again, the kingdom of heaven is like a merchant seeking fine pearls, and upon finding one pearl of great value, he went and he sold all that he had and he bought it. First of all, in order to be in God’s kingdom here on earth, King Jesus must reign in our heart. That’s who we must seek first and foremost. And nothing else is as important. Never put Christ in second place, third place, last place, or any place but first. If we put Jesus first in our lives, we will find the Kingdom in our midst. Colossians 1:17-18 And he is before all things, and in him all things hold together. And he is the head of the body, the church. He is the beginning, the firstborn from the dead, that in everything he might be preeminent. Jesus should be first in importance, first in our time, and first in our choices. Don’t speak about one day following the Lord, put Him first today and every day. We must seek first His kingdom and His righteousness every day; otherwise, we will begin to worry and start seeking the things of this world again. The Lord Jesus said in Matthew 5:6 “Blessed are those who hunger and thirst for righteousness, for they shall be satisfied.” We know what it is to be hungry and thirsty. We want food! We want water to drink! We want it so badly we have to have it right now! Do you want an intimate relationship with Jesus Christ that badly? We cannot pursue the Kingdom of God and His righteousness if our hearts are filled with worries and sins. Fear, doubt, worry, and sin will rob us of our faith. Some folks play at religion but never seek first the Kingdom of God. They want to do things their way rather than God’s way. They want to seek the “American Dream”, live like the world, and still go to Heaven. However, that’s impossible. Now here is a daily, moment by moment question to ask ourselves: Will we live according to the Holy Spirit or to the desires of our flesh? How we answer that question every moment of the day determines what we seek and find. The Kingdom of God is found through an intimate relationship with Jesus Christ and walking according to His Spirit. Have you ever sought God with your whole heart? We have no excuse. We are as close to God as we want to be! Nothing and no one is holding us back from seeking an intimate relationship with Jesus Christ, nor finding His Kingdom and His righteousness. Not even Satan, whom we have authority to rebuke in the Name of Jesus Christ. The pursuit of the American Dream only leads to a nightmare. 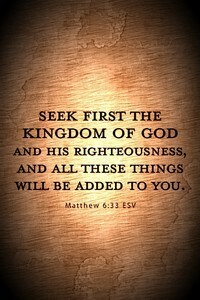 We are to seek first the Kingdom of God. Worry and fear come when we are seeking the American Dream instead of the Kingdom of God. Unless we quit following our flesh and get right with God, we have reason to worry, because our way leads to Hell! 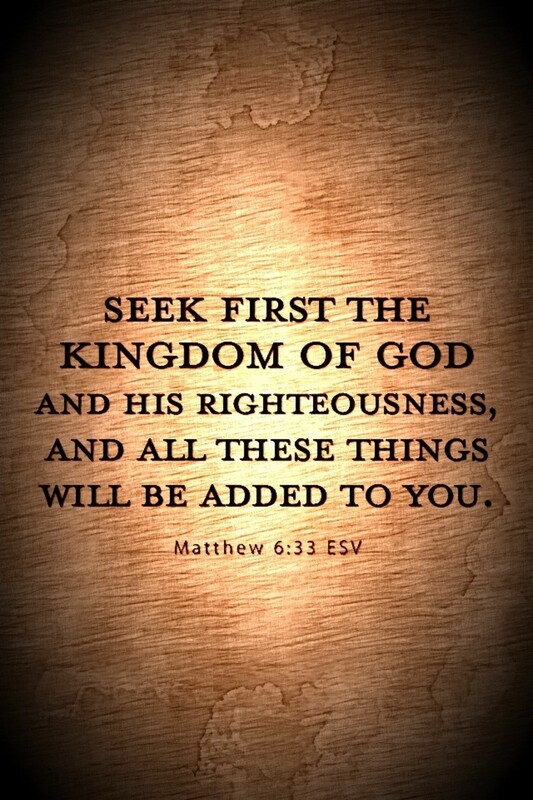 However, Jesus promised that if we seek first His kingdom and His righteousness, “all these things will be added to you.” God will provide food, clothing, and the necessities of life, if we seek Him first! Do you believe Him? If so, trust Jesus and obey Him. When we put Him first in our lives, He meets every need. The banks may fail. Our nation may go bankrupt. However, God’s supply house will never run out. When we seek God first, the Lord also seeks us out, to strongly support us. God loves you. He loves you enough to take your burdens. So, once you put your worries into His hands, leave them there. Let the past be past, and don’t borrow trouble from the future. Don’t let the problems of life steal your faith or cause you to doubt God’s love. Don’t let doubt and uncertainty steal your joy and hope. God is faithful. And you can trust Him. 2 Timothy 1:12 I know whom I have believed, and am convinced that he is able to guard what I have entrusted to Him for that day. Are you convinced that God will guard you and meet your needs? Then instead of worrying, praise God and give Him thanks. Tell Him you are grateful that He loves you, and that He cares for you every day, and provides for your needs. You won’t wake up from the American nightmare and find peace and joy any other way. However, these promises of God only apply if you are a believer in Jesus Christ and following Him. What does that mean? How does one become a follower of Christ? First, believe that Jesus Christ is the Son of God, who died for your sin on a cross. Then publicly confess Jesus Christ as the Son of God, repent of your sin, and be baptized into Christ. Your sin will be forgiven and you will be born again of the Holy Spirit. The Holy Spirit will fill you with peace and enable you to stop worrying. He will increase your faith day by day, and give you grace to continue seeking first the Kingdom of God and His righteousness.